Most of us have heard stories of redemption where someone is saved from something. The something could be a person, a destination or place, or a situation of their own or other people’s making. 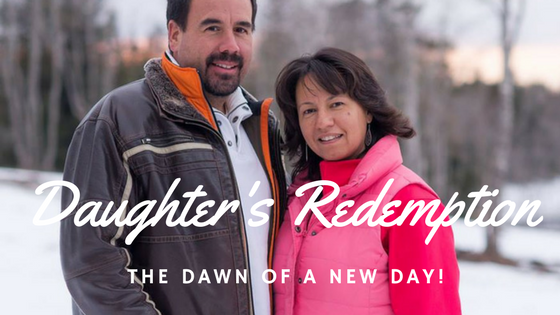 My name is Dawn; the story of my life is one of a daughter’s redemption. I have been saved many times from situations, beliefs or ideas, and behaviours of my own and others. Sometimes my salvation has been quick or even instant. At other times, I have come to a slow awareness of salvation available before I could walk into it. The most important salvation of my life was both instant and a slow realization: salvation from my own worst self, fears, sin, and ignorance of Jesus Christ. As a young girl, my little sister, Rhonda, and I lived with my addicted dad. He was one of the few single fathers in the 70’s. I already had experienced much fear, pain and loss. When my parent’s marriage disintegrated, my mother was separated from Rhonda and I. My father loved us deeply; he also loved the drugs he used to pacify his wounded heart and mind. and lack of adult supervision and structure. Jesus introduced Himself to me. I was 8 years old and beginning to have an awareness of and feel frustration with my home life. My entire little-girl heart LOVED my father deeply: flaws, secrets, instability and all. I was beginning to see direct effects of his poor decision-making on Rhonda and I. “Why can’t we see our mom? Why do we move all the time? Will we have to go to another foster home? Why are police always at our house? In the midst of the darkness, danger and fear in my home and heart, the strangest, most unexpected thing occurred! A school bus started coming to our home to pick Rhonda and I up for Sunday School! Not only that, the same bus came and picked us up on Wednesdays for Pioneer Girls, a fun group for girls at church. Twice a week, the yellow bus brought us to a Holy Spirit-filled church where we learned about Jesus for the first time. During one of these groups, my teacher took me aside and shared how Jesus knows and loves ME. She asked if I’d like to know Jesus and invite Him into my heart to be with me always. I did not have to think long! I did not know much about Jesus. What I had heard so far sounded wonderful! I chose to believe that God and Jesus were real and that they could and would help me. And He sure did help me! The change was instantaneous! I was no longer alone as a small girl in a big world. I began to talk to Him and believed He heard my prayers. My father was not a believer. He made it very clear he would never set foot in church. Either he knew we needed it, or he was glad for the structured activity it gave us, so he let us attend. Sometimes, the help Jesus offers is painful to receive, centering around earthly change and loss. This is also my story. Within a few months of being introduced to Jesus, our lives would be forever changed. We moved that spring to a large house outside Calgary, Alberta. The indoor pool, 4 bedrooms and 100 acres of land were welcome. As a little girl, I had no way of knowing my dad had become deeply involved in a drug ring. The property was owned by someone in that circle. We were allowed to live there with expectations of my dad. We finished the school year at a new school and experienced another month in foster care, before returning home to dad and country life. Our grandparents came to take us to Regina for the summer vacation. We were excited! We loved time with grandma and grandpa! Here there was Sunday school, lots of yummy food, love, attention and care. Within 2 weeks of kissing and hugging our dad goodbye, we received the worst news any child can hear — our dad was no longer alive. He shot and killed himself! Grief, loss, tears and sadness became our companions that summer. Adults decided the best care for us. Two little girls aged 9 and 7 were required to begin a new chapter in life. Early in this experience of loss, I came to a realization: life was not easy nor always good with my dad. We LOVED our dad and wanted him back with us, but I also had to admit we were heading down a dangerous road in life. I began to see how Jesus was intervening to save Rhonda and me. God was not responsible for or caused my dad to take his own life. God’s will is never death or sin. I am assured that God was grieving for the loss of his son, our dad, alongside Rhonda and I grieving for our father. After my heart healed a little, I was able to look back at life before and after losing my father. I began to learn that God sometimes allows deep pain and loss because He knows it can lead to equally deep trust and life. Can and will we surrender and trust Him to allow His tender healing of the hurts? Life began again in July, 1980 for me. It is not the end of my story, but it was the end of that chapter of my story. I thank Jesus, Father God and Holy Spirit for walking through that season with me. I’m also thankful to the Pioneer Girls leader, loving praying grandparents, and for the prayers and actions of others who gently circled us. When we meet Jesus face to face, He will introduce us to the many people who influenced our young lives. And today? These many years later, how has life unfolded? Twists and turns! Lumps and bumps! Jesus continues to surprise! The latest is a call to the woods of Tracy, New Brunswick. Here my husband and I have committed a year of our lives to volunteer. We are learning a program model for a Christ-Centered residential addiction program for men called “Village of Hope”. Some days we feel we fall short of the call, but we press forward knowing He has led us here for this time and His purpose. There’s no other place I’d rather be! Jesus continually called my name, even after a long season of running away and denying hearing His voice. I am blessed on earth to be called “mother” “grandmother” “wife” and “friend”. The core of my identity though is knowing my name as “Daughter”. I spent many years not knowing the experience of being addressed as someone’s daughter. Now my Heavenly Daddy gave me the mind and heart-jolting revelation, “You are MY daughter”. The sweet reward of redemption! My response is to live as a child of the King – by spreading seeds of His joy, His peace, His love and light. To do so allows me to thrive. Thrive Dawn does! Dawn loves and cares for others passionately and genuinely. It is fitting that Dawn is the first to share her testimony, as representative of her First Nations Indigenous heritage. Dawn’s redemption continues to influence numerous lives nationally. She effectively “mothers” multitudes, inspiring them to break free from generational and personal places of pain and addiction. I am proud to call Dawn a friend, a sister, and partner in the work of Christ. She is a humble “daughter” of her Father God in the fullest extent of the word. Thanks for sharing Dawn’s redemption story. She is an amazing lady! Yes she is, by God’s grace! Thank you MaryAnn for providing this amazing format for beautiful people like Dawn to bravely share their journey to the Lord. You are both loved friends of mine and cherished daughters of our Most High God! Thank you Dawn and Maryann. The honour is all mine! We are surrounded by brave warriors, like Dawn, who have not just survived but who are thriving in the grace of Jesus Christ. Their stories must be told for God to get the glory He deserves. Thank you Maryann and friends for the encouraging words of support. God is Great! Be glorified Lord!